An old-timer when it comes to CPOE, a North Carolina medical center offers pointers on how to realize the technology’s power. 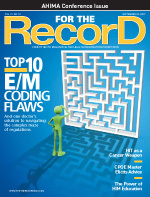 To qualify for the financial incentives under the HITECH Act, some hospitals are speeding up their plans to implement computerized physician order entry (CPOE) systems. According to industry experts, less than 15% of hospitals currently use CPOE, leaving a large number to learn lessons from the few that have made the leap. Alamance Regional Medical Center in North Carolina was among the earliest CPOE pioneers, having implemented the technology more than a decade ago as the first step in a phased approach to deploying clinical information systems. From the vantage point of 10 years’ experience, the course charted by Alamance can guide other organizations that want to use CPOE as a starting point for an EHR installation. “What motivated us to begin our clinical information systems implementation was the realization that other organizations had more information about how we provided patient care than we did,” says Terri Andrews, RN, MBA, Alamance’s clinical systems manager. “We were determined to create a useful tool for our physicians and clinicians, so we relied on them to define what would be of value to them and involved them heavily in the technology selection process.” After researching several systems, Alamance selected Eclipsys’ CPOE technology for two reasons: It was the one physicians and clinicians found to be the most intuitive, and it had superior clinical decision-support capabilities, which still provide value today. Over the 10-year period, Alamance used the phased approach for both the consecutive deployment of technologies and the rollout to various areas of the hospital. This model allowed physicians and clinicians to adjust to electronic records gradually—from orders to documentation—to a point of being almost completely paperless. To guide the deployment of CPOE and the remainder of the clinical information systems, Alamance created two steering groups that are still active today. The Physician Review Board, consisting of physicians representing the different specialty areas on the medical staff, served as an advisory council and clearinghouse. Its members tested new features and functionality and developed standards and best practices. The heavy involvement of Alamance’s Physician Review Board and Clinical Informatics Council was critical to the success of its journey from CPOE to clinical information systems. “Clinical analysts with nursing or pharmacy backgrounds have representation on the two groups, so that information can flow from team to team and there is no redundancy because each group knows what the other is doing,” says Andrews. “A popular alternative today is to start by creating a clinical informatics department with a dotted line to the CIO [chief information officer]. However, our model has proven successful and we see no need to change it.” Even today, the two groups are the most powerful entities in the organization and are instrumental in guiding project teams to deliver what clinicians want. The order entry process presents many opportunities to introduce clinical decision support—for example, alerts. Every time a new alert is installed, Alamance’s IT department monitors it to see how often it is viewed and whether it influenced the physician’s practice. The Physician Review Board then determines whether the alert is worth retaining.